Screws that are stuck due to corrosion, heat, or from being installed too tightly in the first place can be a real challenge to remove without damaging the surrounding structure. 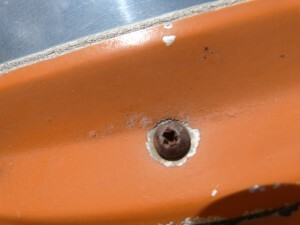 Corroded exhaust studs and nuts can cause a lot of grief, especially if the stud breaks while trying to remove the nut. Even rivets can be challenging to remove, depending on the amount of access one has to drill them out. When using a drill driver to remove screws, use a lower torque setting at first so that the drill will engage the clutch and slip internally when encountering a stuck screw, rather than allowing the bit to slip in the screw head. Screwdriver bits that are rounded on the ends are much better than pointy bits because they seat further into the screw and come into contact with more of the surface. Drywall bits are usually rounded on the ends and work well. Using a speed handle with a socket to hold the bit can help give more torque while also keeping pressure on the screw head to help eliminate slippage of the bit. Electric impact guns work well too, as long as adequate pressure is applied to keep the bit from slipping. If a screw head becomes rounded out, extra care must be taken when further attempts to remove the screw are made. Soaking a stuck screw with a good penetrating oil like Mouse Milk, Aero Kroil, or PB Blaster, will help to break it loose, especially if the fluid makes it to the threads. A wide rubber band placed between the screw head and screwdriver bit can help to eliminate slippage and provide a better grip. Dipping the bit in valve grinding compound also helps it to grab better. If the screw is a button head type, pliers can sometimes be used to grab and turn it. Snap-on sells small red handled ‘screw pliers’ which work well at times. If the screw head becomes so stripped that nothing will grab anymore, it will be necessary to drill the head off or to drill a hole in the head and use an easy out tool to remove it. An “easy out” is a bit that grips into the screw head as it is turned left. The trick when using one of these is to drill the hole deep enough for the easy out to fit into so that it doesn’t slip, but not too deep so as to weaken the screw and cause the head to pop off. There are two basic types of easy-outs: the long slender kind that are not much bigger around than the associated drill bit that they are used with; and the type that fits on a socket. The styles that accommodate a socket work best because a lot of downward pressure can be applied as they are turned. Lightly tapping the top of the ratchet with a mallet as it turns will help to keep the easy-out seated and less prone to slippage. This tapping action also jars the screw, helping it to break loose. Take extra care if the screw is inserted into a “blind” fastener that is inaccessible without major disassembly of other components. Be patient, and do not drill too deep too soon. Fuel tank screws, for example, are some of the worst to remove. Not only are they most often screwed into blind fasteners, but they are rarely ever removed, so they become corroded in place. Most of the time, several screws will have to be drilled out to remove the fuel tank. Removal of seized bolts and nuts can also be tricky. Use a six-point socket on these, rather than a twelve-point to help eliminate slippage. If the corners do become rounded off, there are socket-type removers that can be used to help grip what’s left. Use a mallet to help seat them on the nut or bolt. As a last resort, nuts can sometimes be removed with a nut splitter or by cutting them with a small cut-off wheel in careful increments. It is easy to damage the stud if the cut is made too deep. If there is limited access, a small cutting tool (like a Dremel) may also be required. Once the nut is cut completely through, tension is released and the nut can be broken off or backed off. The worst nuts to remove are the ones that attach the exhaust system to the cylinders. If these have not been removed in a long period of time, they can be almost impossible to break loose. The studs themselves can be so rusty, that it is hard to even recognize the threads on them. The best advice for these is to soak them with penetrating oil as much as possible before any attempt to remove them is made. A nut extractor set can work well on exhaust nuts, as the knurled grooves will grip what’s left of a rounded or corroded nut. If a stud does break, it usually will require removal of the cylinder to replace it. If the stud backs out, that is not a problem; it can be re-installed without pulling the cylinder. A stuck screw or nut can really slow down a project and cause a lot of extra work, but knowing a few tricks to remove them can help alleviate some of the grief.